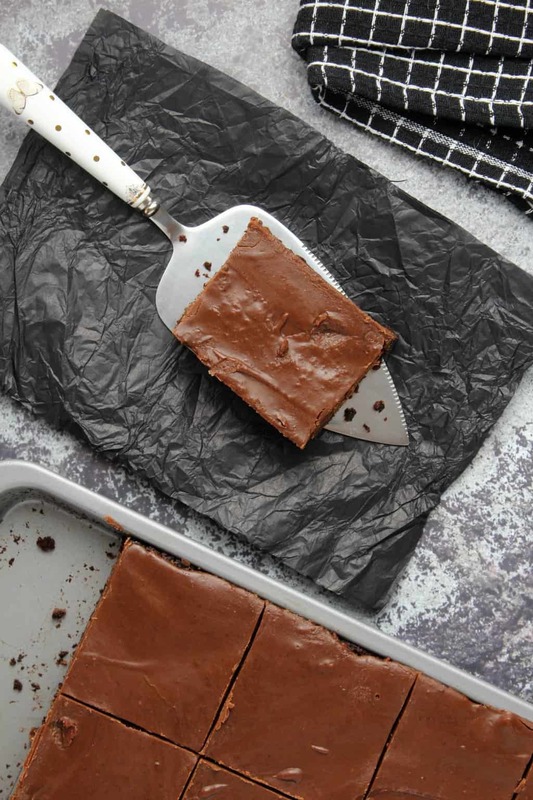 These vegan zucchini brownies are so chocolatey and fudgy! All that, and they’re covered with a seriously amazing chocolate fudge topping. 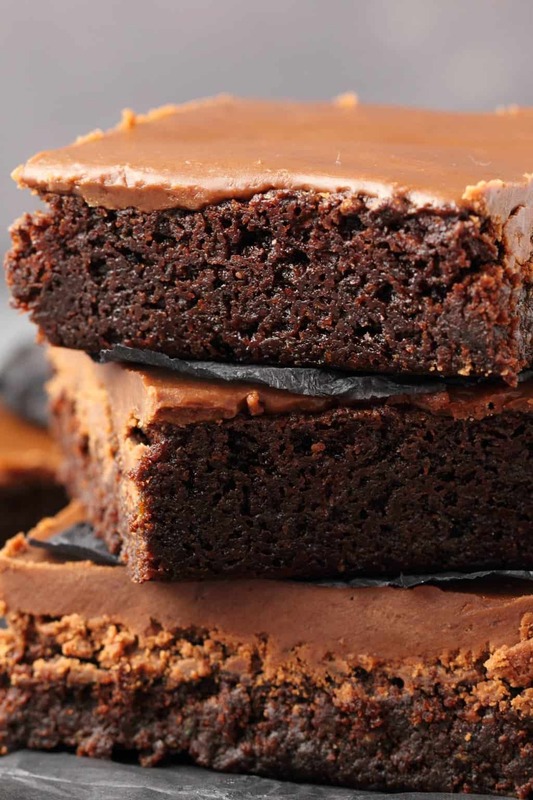 When it comes to brownies you get ‘cakey’ brownies and ‘fudgy’ brownies. Cakey brownies are more like cake. I’m a fan of the fudgy brownies. 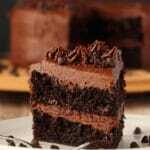 I mean I love cake, but cake is cake, and when I want brownies I don’t want them to taste just like chocolate cake. So the difference comes about from the amount of oil you use. 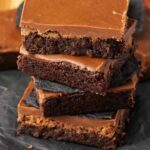 I tried these brownies with 3/4 cup of oil and they were good, but they were definitely falling on the ‘cakey brownie’ side. So I increased the oil to a full cup and then I got that fudgy brownie perfection that I was going for. 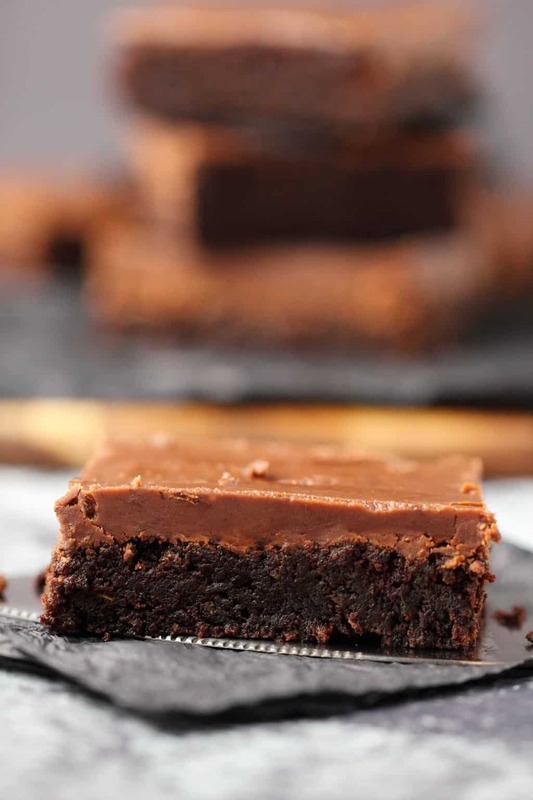 The zucchini in these brownies adds a lot of moisture, which is why I initially thought 3/4 cup of oil would be plenty, but to get your brownies to the perfect state of fudginess you just can’t be shy with the oil. The batter is very dry for this. So don’t panic and think I’ve left off an important ingredient from the recipe card! It’s all there, you just have to be a little patient when mixing the batter. Start mixing it, and then leave the bowl for a couple of minutes while you go and spray your quarter sheet baking pan with non-stick spray. Then come back to it and mix again. Leaving it for a couple of minutes will allow the zucchini moisture to seep into the other ingredients and suddenly it will come together perfectly, exactly like you see in the photo above. It’s a super thick batter but that’s how it’s supposed to be. 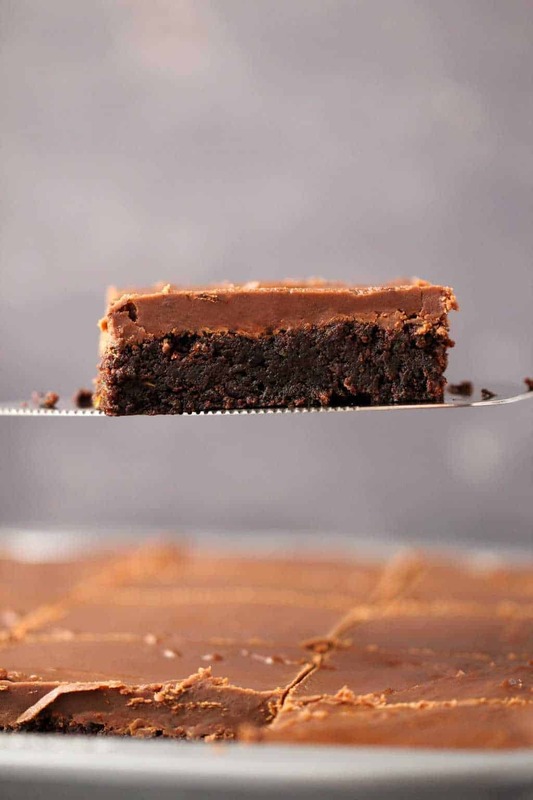 Transfer the batter to your quarter sheet baking pan and smooth down into the corners using the back of a spoon to spread the batter evenly across the baking pan and then you bake those brownies! Yum. 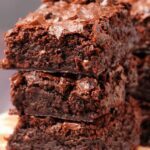 This recipe is adapted from my simple vegan brownies recipe, but that recipe doesn’t have any zucchinis in it. Zucchini basically makes your batter look pretty odd, but the end result is indistinguishable from regular brownies since you don’t taste the zucchini, or see any trace of it, once baked. So you get some hidden veg in with your dessert, which is such a great concept. 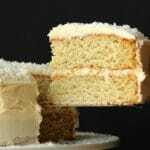 It’s not just the oil that we’re not shy with in this recipe, it’s the sugar too! But perfect fudginess requires lots of cocoa, lots of sugar and lots of oil along with two full cups of shredded zucchini. But let me tell you, when you’ve had one of these vegan zucchini brownies you’re going to really KNOW you had dessert, and you’re going to be so satisfied sitting peacefully there in chocolate heaven, there won’t be any hint of ‘well now that was just too much sugar’. You feel me? 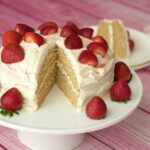 But seriously, if you are the type of person who tends to not really enjoy frostings too much, like if you’re the type of person who eats the cake and leaves the frosting behind, then you can just leave this topping off altogether. For you? 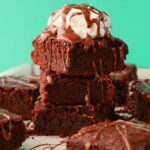 Serve these brownies with some vegan whipped cream! Unsweetened! You will like that more. But if you’re the type of person who eats ALL the frosting with your slice of cake, then you’re going to love this chocolate fudge topping. Definitely don’t skip it. 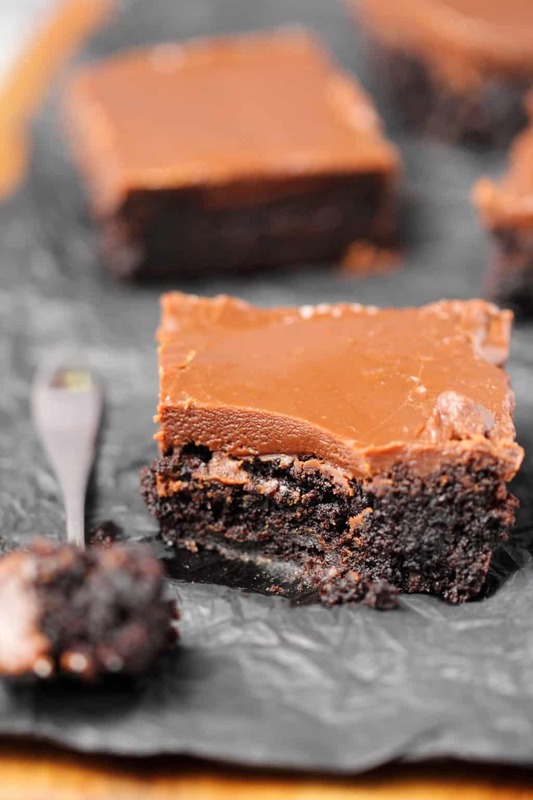 The topping is made on the stovetop and isn’t like a regular frosting at all, more like a chocolate fudge sauce that hardens beautifully. You make it by melting some vegan butter in a saucepan and then adding sugar and soy milk and bringing it to a full rolling boil, then you remove it from the heat and stir in vegan chocolate until melted in, and then pour it all over the top of the (still warm) brownies. Now that is just brownie perfection. Double chocolate deliciousness. 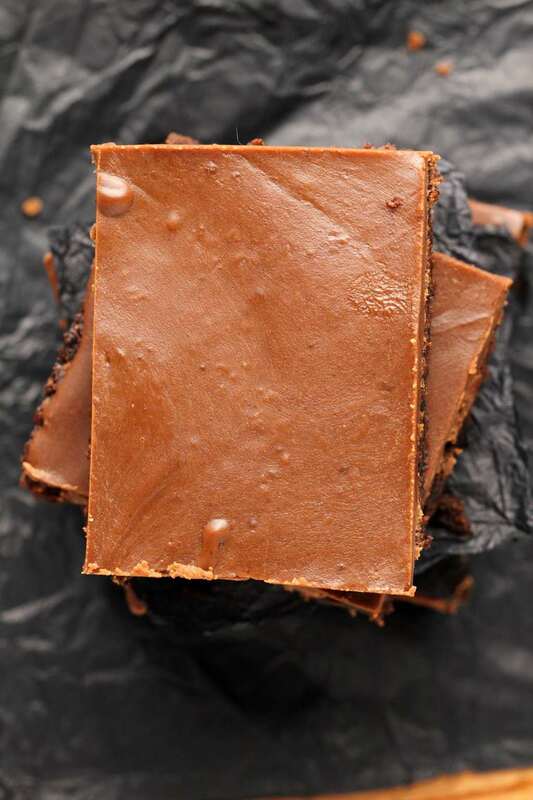 Store the brownies in an airtight container in the fridge where they will stay delicious for up to 5 days. You can enjoy them as is, or heat them up a little in the microwave first! Oh my! 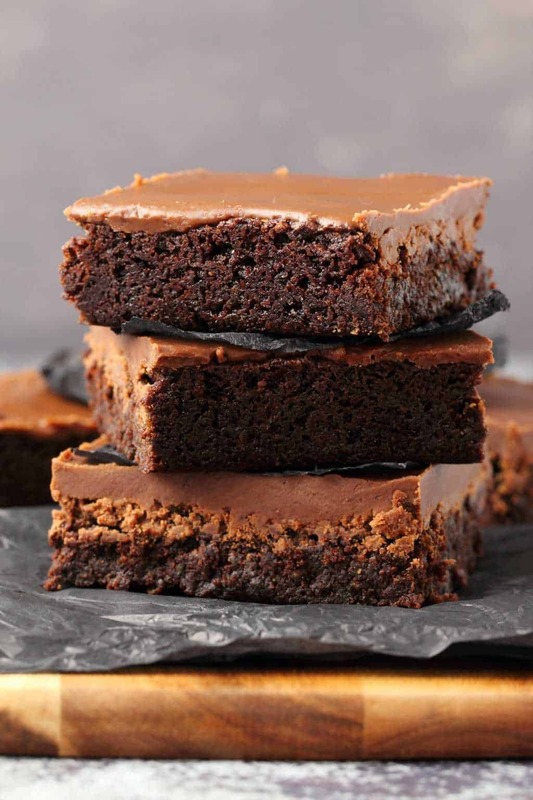 What do you think of these vegan zucchini brownies? 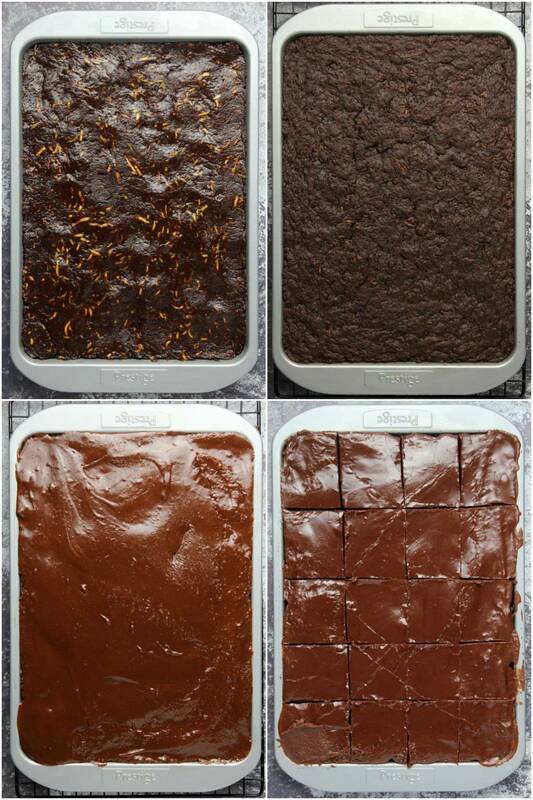 Are you a fudgy brownie or cakey brownie person? Let us know in the comments and please rate the recipe too! Thanks! Sign up to our email list while you’re here too! You’ll get an awesome (and free) recipe ebook containing 10 delicious vegan dinner recipes and you’ll be the first to know when new recipes are posted to the blog. 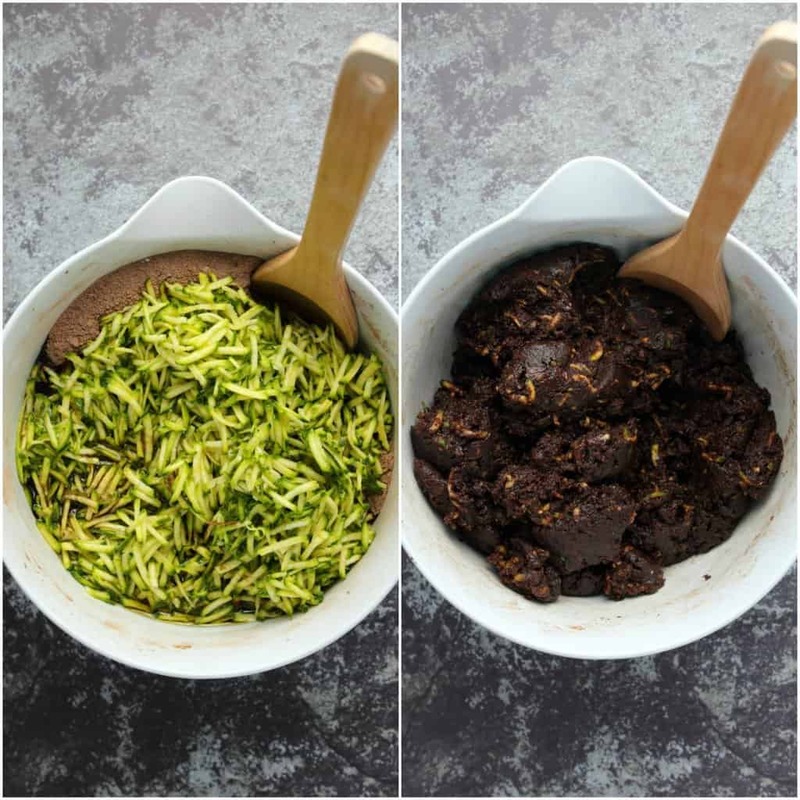 Fudgy and rich vegan zucchini brownies with a chocolate fudge topping. 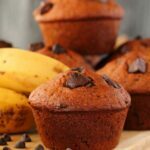 Mega-chocolatey and so easy to make, and you’ll never know there’s zucchini in them! Sift the flour and cocoa into a mixing bowl and then add the white sugar, baking powder, salt and instant coffee powder and mix together. Add the shredded zucchini, oil and vanilla and mix. The batter will look much too dry at this point and like it won’t come together. Leave the bowl to sit for a couple of minutes while you prepare your baking tray. Spray a 9×13* quarter sheet pan with non-stick spray and set aside. Return to your mixing bowl and stir again, the zucchini should have released a little bit more moistness into the bowl and it should come together now into a thick batter. Transfer the batter to the baking pan and use the back of a spoon to press it down and smooth it out so that it reaches all the corners and is evenly spread out across the baking pan. Bake for 30 minutes. Remove from the oven and leave to cool. 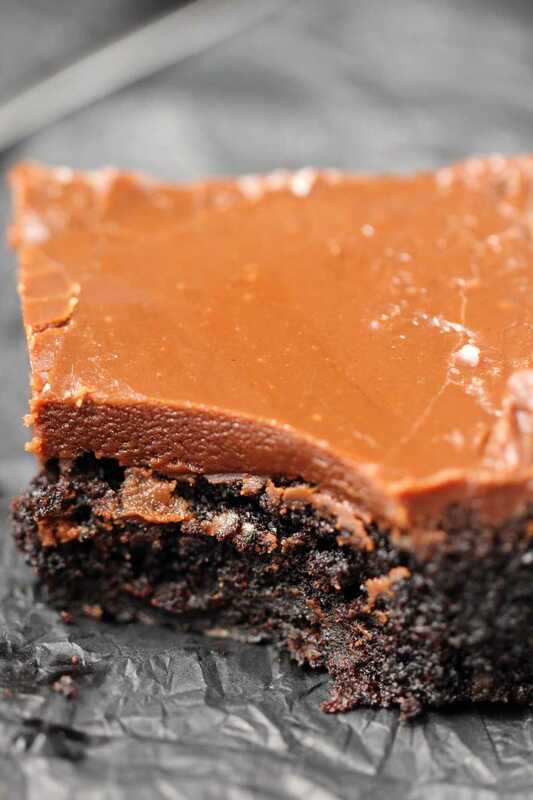 While the brownies are cooling, prepare your chocolate fudge topping. Melt the vegan butter in a saucepan and then add the sugar and soy milk. Stir constantly until it reaches a full boil. When I say full boil I mean it will start foaming up as it boils (use a big enough pot to allow for this to happen). When it’s reached a full boil remove from the heat and add in the chocolate chips and stir furiously until they have melted completely and it’s a thick chocolate sauce. It will start to want to set once the chocolate is melted in so work quickly. Pour it immediately over the top of the still warm brownies and leave to set. 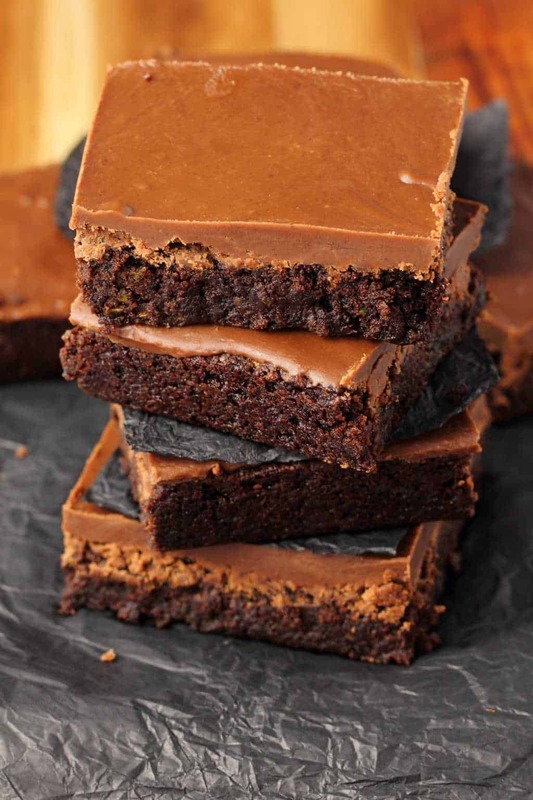 Once the topping has set cut your brownies into squares and enjoy. *You can switch soy milk for almond milk if you prefer. *You can use any vegan chocolate it doesn’t have to be chocolate chips, just break it up into small pieces first and make sure the amount is correct by weight. *If your measurements are not exactly the same for your quarter sheet pan (there can be a little variety in the sizes) then don’t worry, a small amount larger or smaller shouldn’t make a difference, as long as it is a quarter sheet pan (and not a half sheet) this should work out fine. 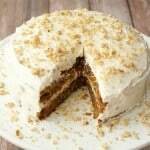 Previous Post: « Vegan Pumpkin Cheesecake – Easy and No-Bake! 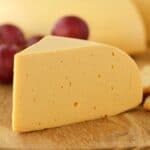 I would like to say a big thank you for all this recipe sharing. I do not write often comment (I’m French and my English is not excellent) but today, I take the time to leave you a comment because I cooked a lot of your recipes and it was one real success (cookies, brownie, raw cheesecake, tiramisu). this allowed me to appreciate the vegan food to my entourage and they want more. 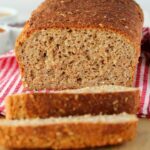 Has anyone tried this with a gluten-free flour substitute? Hello, can I change the zucchini to beetroot? 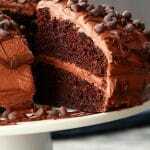 I love baking cakes with beetroot and chocolate. Had a bunch of zucchini and wasn’t sure what to do with it – then I found this recipe! Best use for zucchini’s ever. Totally delish, thanks.